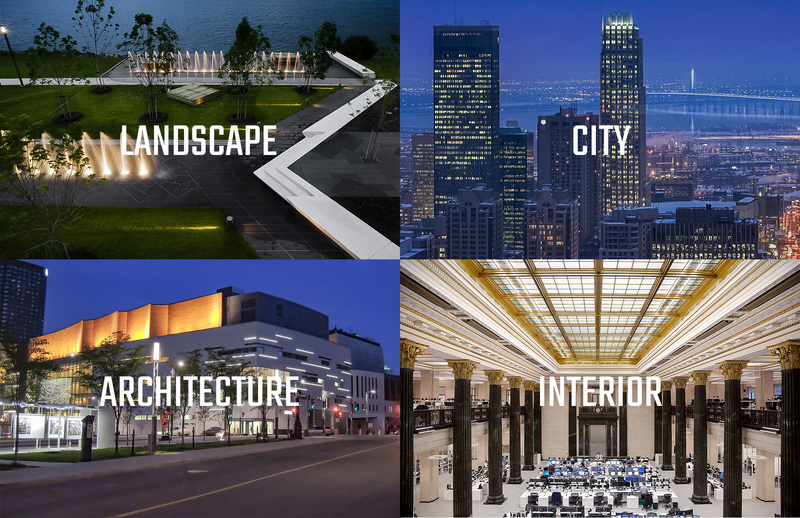 The Ombrages Group has been working for more than 20 years in the field of architectural and urban lighting. It offers lighting services in interior design, architecture, urban planning and landscape architecture. Develop design criteria and concepts, implement intervention strategies, design original, and creative solutions, create visuals (infographics), respond to the diversity of needs in accordance with clients’ expectations (creativity, aesthetics, comfort, functionality, environment, health, integrity, viability, etc.). Take charge of the realization, the viability and the maintenance of the project, elaborate the calculations and photometric rendering (AGI32 & Dialux), observance of the local and global lighting standards (e.g. IESNA, BNQ, AFE, ASHRAE, LEED), prescribe apparatuses and systems of lighting, manage lighting setting, control, and programming (DMX, DALI, etc. ), use innovative practices and new technologies, manage economic impact. Development of specific lighting design solutions, creation of custom luminaires and optics. “Lighting for the public”: Improving the quality of living spaces and lit environments (multidisciplinary, participative, collaborative approaches), creating a space for creation and experimentation (research-action), guiding practices and helping decision-making , understand the new challenges (society, environment, economy, health, safety/security, technology, etc.) and meet the needs of innovation. Lighting has an impact on various aspects such as security, safety, economy, health, environment, comfort, social and cultural concerns. It is therefore important to consider these different aspects in order to ensure the viability and success of the projects. 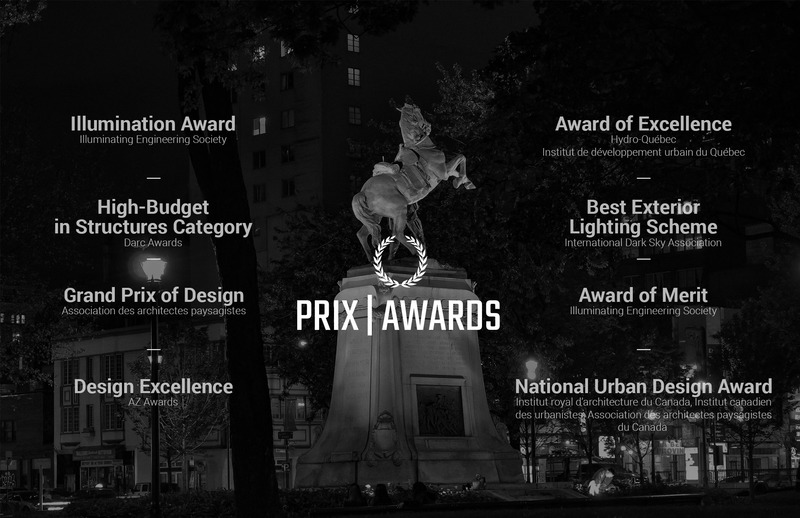 The Ombrages Group has received awards from organizations and associations as the Illuminating Engineering Society of North America -IESNA-, Dark-Sky, Darc Awards, Montreal Design Grand Prix, International Illumination Design Award -IIDA-, Canadian Society of Landscape Architects -CSLA-, Hydro-Québec and the Urban Development Institute of Quebec-IDU-, that attest the quality of the Ombrages Group lighting design projects. Environmental, technological and social issues have become primary considerations in projects. The protection of the starry sky, the fauna and flora, and the questions of negative impacts on health are all concerns for stakeholders. 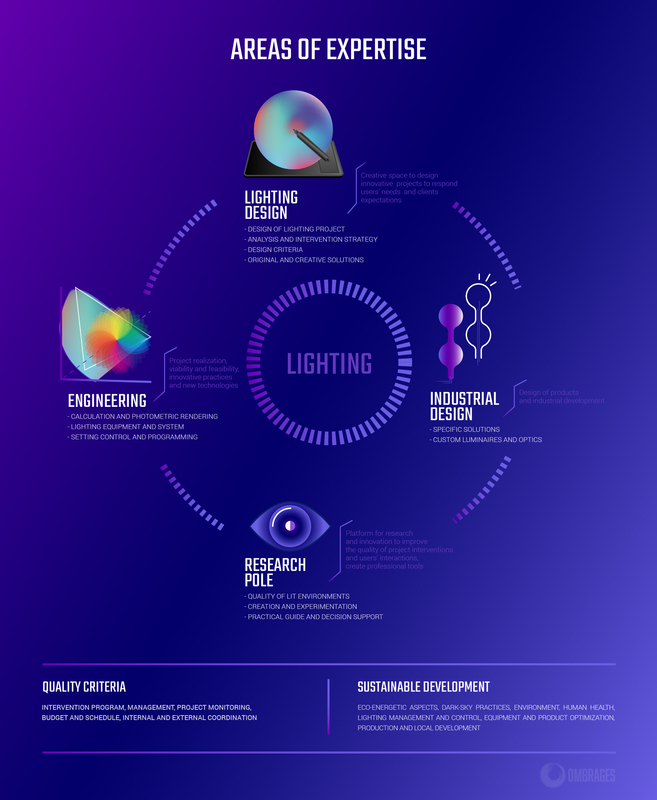 The evolution of technologies has led us to rethink processes and implementation but also lighting needs. The well-being of the users remains at the heart of our process. We believe that lighting contributes to improve aesthetics, increases the visual comfort, and aids in mobility with the ultimate goal to achieve a better quality of life. 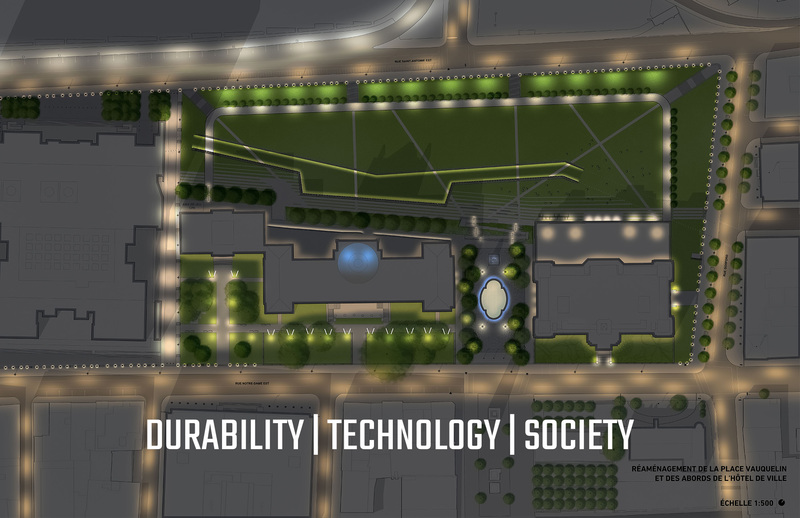 With its four (4) divisions; in design, engineering, product, and research, the company has developed diverse and interconnected expertise to respond to all opportunities in a project. The Ombrages Group is involved in a variety of disciplines such as interior design, architecture, urban planning and landscape architecture, and sectors as diverse as individuals and residential, businesses, retail and leisure, cities and municipalities, institutions and government, and real estate developers.